Do you have money in a tax-deferred retirement account such as a 401(k), IRA or 403(b)? If so, you’re sitting on a tax time bomb. I’m going to reveal the tax traps you face and show you how to move toward a 0% tax bracket in retirement (legally!) – but not by doing it the way most people do it, which is by being broke! If the tax rates are actually lower during your retirement, you might come out ahead by deferring your taxes. But where do you think tax rates are headed long term? You must consider what tax rates might be during a retirement that could last 30+ years. Most people we talk to think taxes ultimately must go up due to the aging demographics of our country and our unsustainable national debt. (Recently the debt passed $21 trillion for the first time.) If tax rates do go up, and you’re successful in growing your nest-egg, you’ll simply end up paying higher taxes on a bigger number. Those pesky RMDs retirees have to start taking from tax-deferred accounts around age 70½ – whether they want to or not – are pushing them into a higher tax bracket. Many people are surprised to discover their income from various sources causes 50 to 85 cents of every Social Security dollar they receive to be taxed. RMDs can trigger a “tax torpedo” that taxes up to 85% of your Social Security benefits. Financial planners and CPAs are seeing retirees’ tax rates double or more because of this! There’s a terrific option available to you that you’re probably not hearing much about. It comes with numerous tax advantages too. I’m talking about the kind of high cash value dividend-paying whole life insurance policies that the Bank On Yourself safe wealth-building strategy is based on. 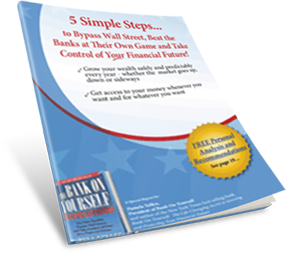 The Bank On Yourself method gives you all the tax benefits and other advantages mentioned above, plus others too numerous to list here. It’s easy to find out how a custom-tailored plan can help you reach your short-term and long-term financial goals and dreams – without taking any unnecessary risks. Just request your free Analysis here right now while you’re thinking of it.